The first airplane to fly Pan American Airways’ FAM 5 foreign airmail route from Miami Florida to the Canal Zone in Panama was a Sikorsky S-38A piloted by Charles A. Lindbergh on February 4 through the 6, 1929. The flight was in reality a recon trip, but it also carried the first mail to be flown on this route. 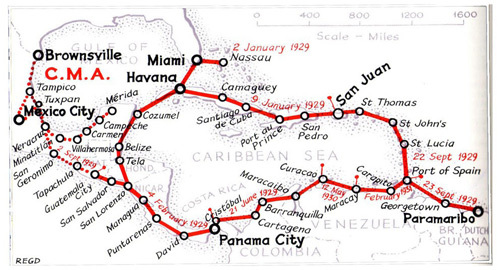 The route was Miami, Havana, Cozumel, Belize, Tela Honduras, San Salvador El Salvador, San Lorenzo Honduras, Managua Nicaragua, Punta Arenas Jose Costa Rica, and the Canal Zone. Above: Lindbergh landed on Cozumel on February 4, 1929 on his way to Panama. 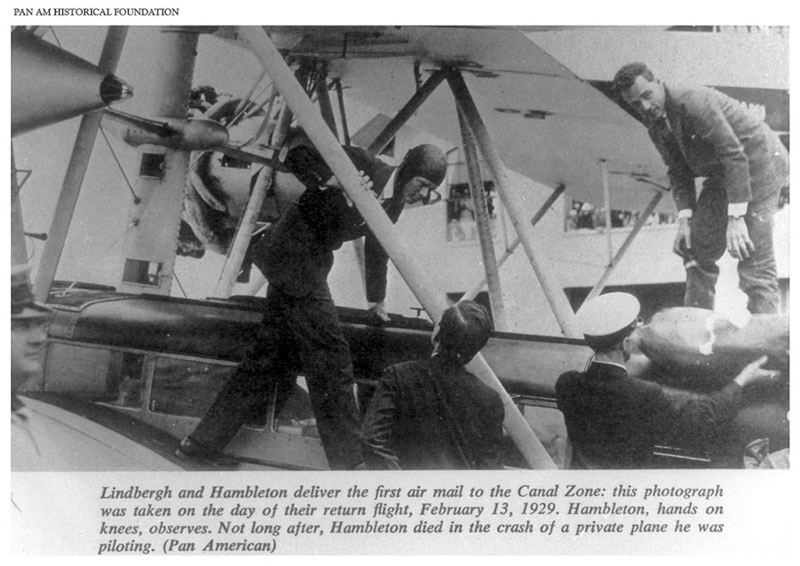 Lindbergh’s return flight from Cristobal, Canal Zone was made on February 10 through the 13, 1929 and he was joined by a second Pan American Sikorsky S-38A piloted by Raymond J. Merritt. 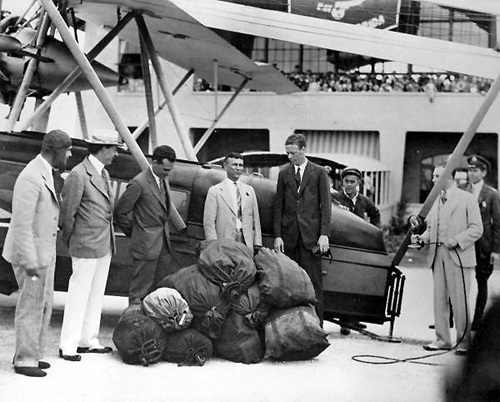 Above: On Feb 13, 1929, Lindbergh and Merritt returned to Miami with the mail they brought back from Panama. 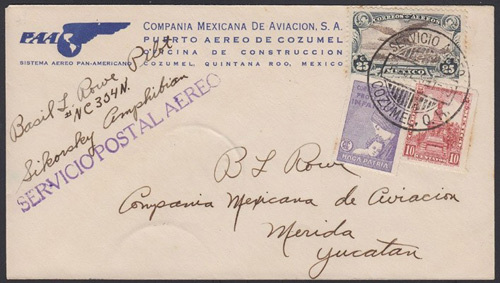 Above: A “first flight cover” from Cozumel, stamped April 18, 1932. Although Pan American planes stopped at Cozumel on the way down to Panama and the way back to Miami beginning in February 1929, they did not pick up or drop off any mail on the island (or anywhere else along the route) on that trip as it was really just a dry run. It was not until April 18, 1932 that the first mail was picked up at Cozumel and routed through Merida to Miami. The business in selling “first day covers,” or envelopes that are cancelled by the postmaster and carried with the first load of airmail from a location, is a lucrative business. Many airline insiders know beforehand exactly when a new route is going to open and send their agents in those destinations dozens of empty self-addressed envelopes to place on the first flight so that they can sell the cancelled covers later. In February of 1929, the insiders in the Canal Zone in Panama were prepared for Lindbergh’s flight and had thousands of envelopes ready to send back with him; so many envelopes that Pan American had to schedule a second plane to accompany Lindbergh’s plane to carry all these extras. 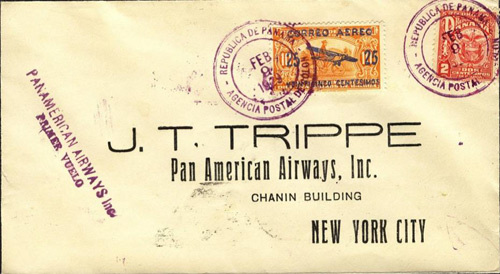 This second plane, piloted by Ray Merritt, also carried a huge amount of mail bearing stamps from the Republic of Panama rather than the US stamps that the Canal Zone mail had affixed. Together, the two planes carried 689 pounds of envelopes! Considering each one of these used envelopes can sell for up to $1,000.00 dollars today, that adds to a pretty penny. On November 13, 1929, Pan American Airways initiated a second passenger and freight (but no mail) route between Merida and Cozumel, flown by their Mexicana de Avación subsidiary. By this time, the Laguna Ciega airport building was completed, but the dirt airstrip (where today’s airport is) was still under construction. Oscar Coldwell’s seaplane ramp at Calle 5 Sur on the Malecon opened a year later and then the Cozumel airport’s second dirt runway was added just to the south of the first, giving us the V-shaped runway configuration we now have. On July 1, 1930, the Cozumel-Miami/Cozumel-Belize flights were increased to twice a week, but, in 1931, Pan Am dropped the Cozumel stop and rerouted the service through Merida. 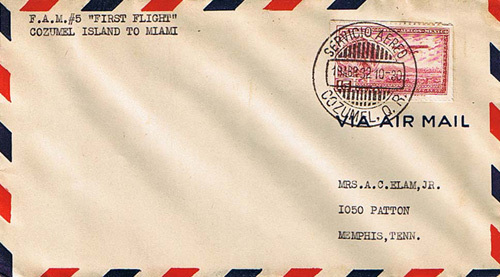 Above: An airmail letter sent from Cozumel’s Airport in 1929. On February 19, 1929, Pan American Airways purchased Compañía Mexicana de Aviación and from then on, Mexicana maintained the Pan American airport facilities on Cozumel. Above: Pan American Airways bought Mexicana de Aviación for $100,000 dollars. 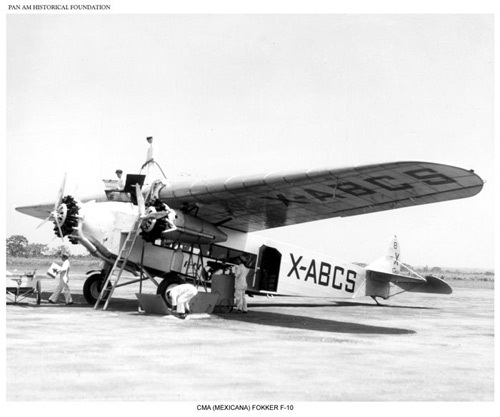 After Lindbergh’s successful inaugural survey flight in February, regular Pan American flight service to Cozumel began on May 21, 1929 with passengers carried once a week on a new Pan American Sikorsky S-38B Amphibion. The eight-seat plane arrived on the island from Miami at 2:10 PM and then departed at 2:30 PM to overnight in Belize. Not much time for the passengers to see the island! The whole 2,064-mile trip to Panama required 56 hours of flying time and two overnight stops. Above: The FAM 5 (Miami to Panama) and FAM 6 (Panama to Miami via the Antilles) combined made the Circle Route; Mexicana’s Mexico routes are included as dashed lines. Mail, passengers and cargo were not the only things Pan American Airway’s planes carried back to Miami. A US public health official realized there may be a potential of the planes carrying live mosquitos from Latina American countries along the FAM 5 route. Upon inspecting 21 incoming flights in 1931, US Department of Health Inspector Grifitts found a total of 29 live mosquitos. The first one he found was, ominously enough, an Aedes aegypti, the mosquito that can carry dengue, yellow fever, and other viruses and disease agents. Soon, the US Public Health Department began requiring all incoming flights be fumigated with hydrocyanic acid gas, a cure almost as worse as the disease. This deadly gas had been used as a chemical weapon in WWII and in a glass capsule mounted on iron harpoons used by whalers in the 1830s to kill whales. Above: The Cozumel airport was first graded by Compañía Mexicana de Aviación in 1929-30. The construction of the Cozumel airport started soon after the first Pan American flight had landed in Laguna Ciega. On October 10, 1929, Charles Lindbergh again visited Cozumel and stayed overnight. The next morning, he made a quick tour of the airport being constructed by Compañía Mexicana de Aviación and reported “Work at the airport resulted in the discovering of several Maya ruins, including a temple which probably dated back before the time of the Spanish Conquest. Well preserved statuary showing the Maya deity, the feathered serpent and other figures were found by the workmen.” The fragment of this stone carving depicting the feathered serpent god is now in the collection of the Museo de la Isla. This report by Lindbergh is the origin of the story of how the US military supposedly bulldozed Maya ruins “when they constructed the airport at Cozumel”. During September 1938, the Expedición Cientifica Mexicana visited Cozumel to document the Maya ruins on the island. The expedition documented sites along the west of the island, including several small sites north of where the airport is located. They saw the ruins of the church south of the airport, but reported no ruins on the airport property, even though this was before any work was done to enlarge the airfield during WWII. Once the first dirt runway at the Cozumel airport was finished in 1930, Compañía Mexicana de Aviación began flying a regular route between the island and Merida with a 14-passenger Fokker F-10. Above: A Compañía Mexicana de Aviación (subsidiary of Pan American) Fokker F-10. 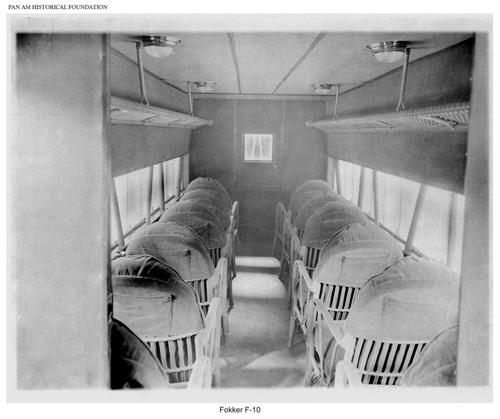 Above: Overhead storage was a problem even back then!